Let's face it. I don't think I read this book from beginning-to-end. The copy I own looks like something I would have picked up at a second-hand book fair simply because I recognized it as an early (1995) semi-classic in the field. It's not a quick read and it requires a certain willingness (and time) to read "deeply" so that the ideas and concepts have time to sink in. I suspect that was intentional on the part of the author. One should not expect an easy quick read from a long-time Harvard Business School professor and researcher. The focus of the book is on how companies that successfully manage technology innovation leverage core capabilities, how those core capabilities are developed and nurtured through knowledge, and where this knowledge comes from. The strong business competitiveness and constant need for adaptation, the forward looking approach, and the strong focus on innovation are all still very relevant close to 20 years after its publication. An updated version of the book might try to tackle how Google, Amazon, and some of the new technology-driven business models have handles core capabilities and knowledge generation. The focus on core capabilities is somewhat linked in my mind to the concept of critical knowledge. No wonder, Dr. Leonard was probably instrumental in generating that connection when I read Critical Knowledge Transfer: Tools for Managing Your Company's Deep Smarts (Leonard, Swap & Barton, 2015). Knowledge management for its own sake, without a clear focus, is one of those "nice to have". However, it's difficult to articulate a clear ROI around something that's "nice to have" but not perceived as critically linked to business results or mission success. Given the realities of limited resources and time constraints, a well-targeted knowledge management initiative clearly tied to business objectives (or the organization's mission in non-profit and government environments) is more sustainable and will deliver more value. I haven't read all of Dr. Leonard's books but I remember reading Deep Smarts: How to Cultivate and Transfer Business Wisdom. It was 2005 and Dr. Leonard was raising the alarm about the risks associated with the baby boomer retirement wave and how it would affect organizations as the people with deep smarts (a combination of judgment and knowledge based on extended experience developing both explicit and tacit knowledge) were leaving the organization. How was this critical knowledge going to be transferred (ideally before they left). I don't find approaches focused on capturing the knowledge of departing employees to be particularly useful, but the issue of knowledge transfer (or knowledge flows) throughout a person's career rather than upon retirement is worth addressing. We should not just be focusing on capturing the knowledge of upcoming retirees. There are lots of organizations nowadays where staff turnover is very high. Shouldn't these organization also get some attention? Does that require a different approach to knowledge management? Do "deep smarts" have to time to grow in high turnover organizations? Set (a.m.) time aside for "deep reading". 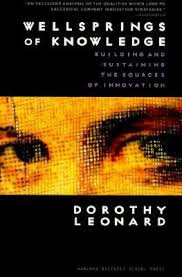 It might be interested to map out the evolution of key concepts in Dr. Leonard's work (core capabilities, know-how, deep smarts, critical knowledge). I see a nice progression while sticking to the same foundations.